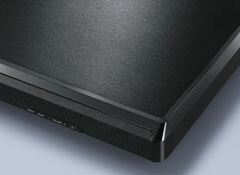 Yamaha Digital Sound Projectors achieve actual (not virtual) surround sound by producing beams of sound that reflect off the walls and controlling their directions. 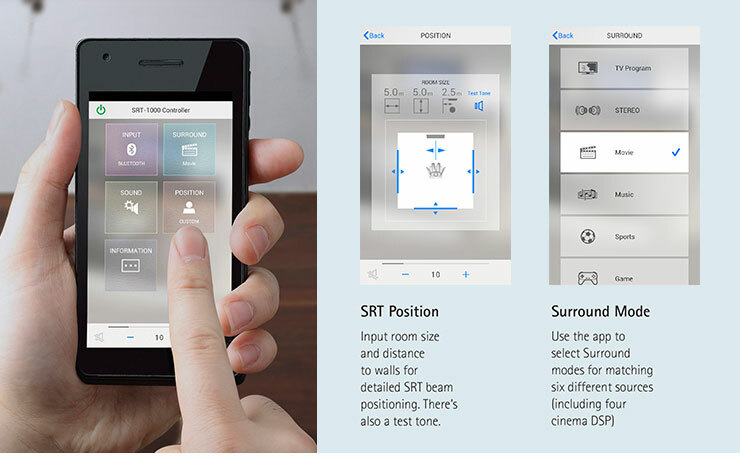 Beam position (listening position) can be adjusted over a wide area by using the remote control or the dedicated app, allowing many people to enjoy the powerful, expansive sound. The SRT-1000’s large capacity cabinet is built using MDF materials ideal for producing good quality sound, with a central array of eight beam speakers and oval woofer units on both sides that together create Yamaha’s original Digital Sound Projector sound beams. 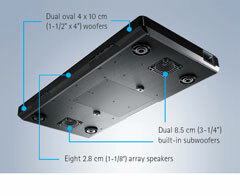 Its surround sound is real and expansive, and with two subwoofer units mounted on the bottom surface it not only reproduces rich bass but also allows independent left and right control of the central and front channel low-frequency components. 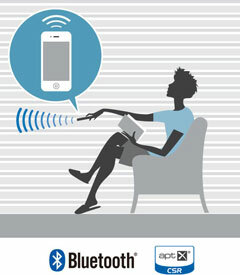 Enjoy outstanding sound localization and powerful sound with your large screen TV. Choose the Installation Style that Best Suits You. In addition to placing it under the TV, the SRT-1000 can also be installed on a shelf or on top of a rack for use with wall-mounted TVs. Space-saving and easy to install. Just put it under your TV. Thanks to its large 78cm (30-3/4”) wide, 37cm (14-5/8”) deep construction, the SRT-1000 can be placed without issues under TVs up to 55 inches wide. And what’s more, because it’s designed to fit easily under your TV, the unit brings you full-scale surround sound without getting in the way of the TV screen. The SRT-1000 has connection terminals positioned on the top and the back to allow for easy connection, and diagonal mounting makes connection to your TV or BD player even easier. 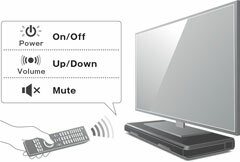 In addition, it connects to your TV via a single cable, so setup is quick and easy. It provides three digital input terminals (Otical×2/Coaxial×1). The SRT-1000 is compatible with popular surround sound formats, such as Dolby Digital and DTS Digital Surround, so you get the full effect of multichannel movie sound. Yamaha’s ultra-sophisticated CINEMA DSP technology creates thrillingly realistic soundscapes in any room. You can select four different programmes, including Movie, Music, Sports and Game. Because it comes equipped with subwoofer terminals, you can add an external subwoofer to upgrade to an even more authentic surround sound system.